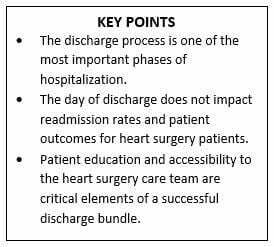 Chicago, October 11, 2018 — Despite a common belief that weekend and holiday discharge after major heart surgery may impact hospital readmissions, research published online today in The Annals of Thoracic Surgery showed that day of discharge does not affect readmissions. Find comprehensive medical information presented for patients by leading experts in cardiothoracic surgery on the STS Patient Website (ctsurgerypatients.org). For a copy of The Annals article, contact Jennifer Bagley at [email protected] or +1 312 202 5865.